All-terrain strollers typically have 3 wheels instead of 4. The front wheel can be locked so it does not swivel on rough terrain. All-terrain strollers have larger wheels. All-terrain strollers have air-filled wheels. 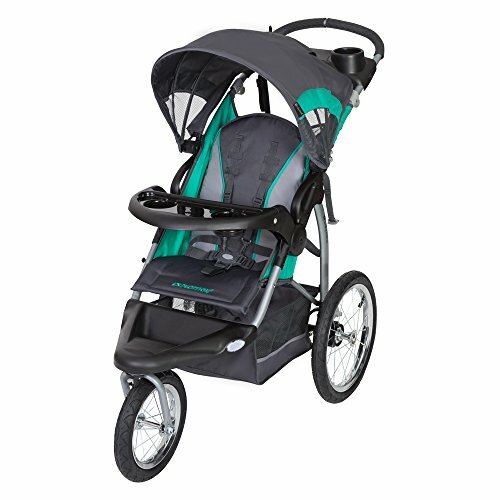 All-terrain strollers are usually equipped with a suspension system. 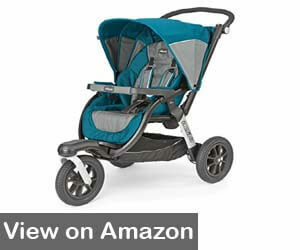 The Graco Fastaction Fold Jogger is one of the best all terrain jogging strollers. The locking swivel front wheel allows you to easily transition from everyday strolling jogging. It holds children up to 50 pounds, and is compatible with Graco Click Connect infant seats, so it will easily go from birth to ready to walk. As one of the world’s most trusted and recognized companies, Graco has been providing innovative, practical, and dependable parenting solutions for over 60 years. Graco is dedicated to put the safety of your child first. Their products are tested well beyond government standards to ensure you child remains safe while using any Graco product – from strollers to car seats. Front-wheel suspension provides easy maneuverability on sidewalks and paths while locking the front wheel will provide extra stability on bumpy or rough terrain. Multi-position reclining seat with plush padding for baby’s comfort. Safety harness can be used as a 5-point or 3-point, so it grows with your child. Storage includes an extra-large storage basket, parent tray with 2 cup holders, and child tray with cup holder. One-hand fold and carrying strap make this stroller easy to handle while holding baby – once folded, the stroller stands on its own until you can load it or store it. Larger cell phones will not fit in the cell phone holder. 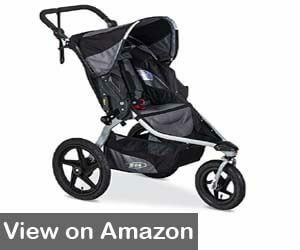 One of the best lightweight, compact all-terrain strollers is the BOB Revolution Flex Jogging Stroller. This compact stroller is designed for children from birth (by attaching a infant car seat) to up to 75 pounds. Because of the compact fold, the Revolution is a great stroller for traveling and exploring the world with your little one. BOB (Beast of Burden) began in 1994 when a bicycle builder and an airline mechanic met in the town of San Luis Obispo in California. One had invented a bicycle trailer and was selling them out of his small machine shop. Together, they created the Beast of Burden company, and have been designing revolutionary products that allow families the freedom to explore nature. Equipped with an adjustable, padded handlebar that has 9 positions and easily adjusts for each parent. The adjustable suspension offers 3 inches of travel adjustment and 2 stages of weight support. Storage includes an extra-large Low Boy cargo basket and built-in pockets for extra storage. 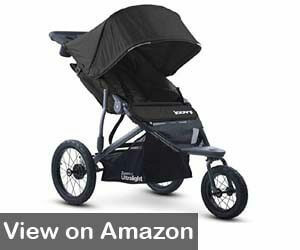 Includes an extra-large UPF 50+ canopy with a large viewing window so you can always see your child. 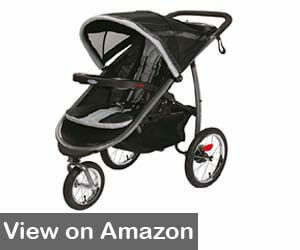 Also available as a double stroller, making it one of the best all terrain double strollers. Some parents had difficulty keeping the canopy opened to cover their child from the sun. 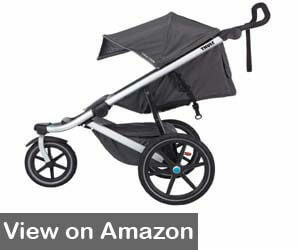 The Baby Trend Expedition Jogger Stroller is also one of the best lightweight and compact all-terrain strollers. The trigger fold easily folds the stroller into a compact position that is suitable for storage or transport – no fighting to get the stroller folded while holding baby. Lightweight steel frame and lockable front swivel wheel promote easy maneuverability while jogging, hiking, or simply taking a stroll around the neighborhood. Headquartered in Canada, Baby Trend has been at the forefront of providing innovative solutions for parents on the go. Baby Trend was the first company to introduce a stroller that allowed an infant to sit and a toddler to stand while riding on the same stroller, which was an awesome invention for parents with more than one small child. Baby Trend is dedicated to providing safe, reliable products at affordable prices. Car-seat compatible to create a travel system for long days outdoors. Holds children up to 50 pounds and 42”. Equipped with a multi-position, padded adjustable seat for baby’s comfort. Includes foot rest reflectors for visibility. Storage includes extra-large storage basket, parent tray with 2 cup holders, and child tray with 2 cup holders. Adjustable canopy to protect baby from sun, wind, and rain. Storage basket has no support, so too much in it and it touches the ground. 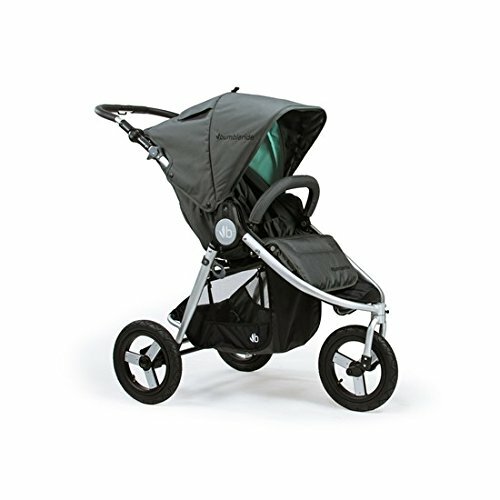 One of the best all terrain strollers with bassinet capability is the Thule Urban Glide Jogging Stroller. 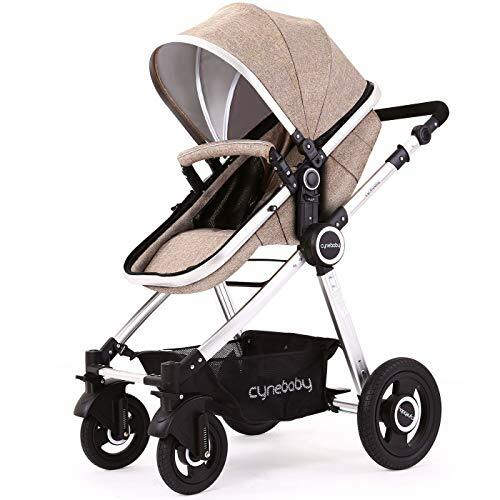 You can pair your stroller with a compatible infant car seat to create a travel system or fold the padded, vented seat to an almost flat position to create a bassinet for your little one. With a 5-point harness restraint system and reclining seat, your little one is safe and comfortable, even on long days outdoors. Since 1942, the Swedish company Thule has been dedicated to helping active families and outdoor enthusiasts transport the things they care about safely, easily, and in style. Thule understands that parents with small children want to explore the world and remain active, so their mission is to develop products that make outdoor life easier for you and safer for your little one. Rear suspension creates a smoother ride over rough terrain. Front wheel swivels for maneuverability and locks for jogging. The seat is padded and vented for baby’s comfort with an adjustable recline from sitting up to lying down. The large storage compartment has a water-resistant cover that zips into place to protects baby supplies from the elements. Adjustable canopy with peek-a-boo window so you can always see baby. The adjustable handlebar is padded and adjusts to a range of heights. Some parents state the seat is smaller than comparable strollers. 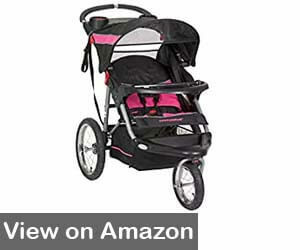 Joovy Zoom 360 Ultralight Jogging Stroller is one of the best lightweight all terrain strollers available. The large, pneumatic tires – 16” back wheels and 12” front wheel – provide a smooth, shock-absorbing ride on any terrain. Whether you are strolling through the park or hiking in the mountains, baby has a comfortable and safe ride for tagging along. Since 2005, this US-based business has designed and manufactured innovative and high-quality baby gear. Joovy is dedicated to making mobility easier for growing families – allowing every member of the family to enjoy exploring the world around them in a comfortable and safe environment. Joovy strives to provide innovative and functional products at affordable prices. Designed with wide seats to hold your child up to 75 pounds. Large canopy with peek-a-boo window allows you to protect baby from the elements while always being able to see baby. Storage includes a storage basket, parent organizer with 2 cup holders and zippered pocket, and mesh pockets on baby’s seat for baby’s items. Tire pump included for worry-free treks in the great outdoors. Compatible with several popular brands of infant car seats. Large back wheels need to be removed before placing in the trunk of a car. 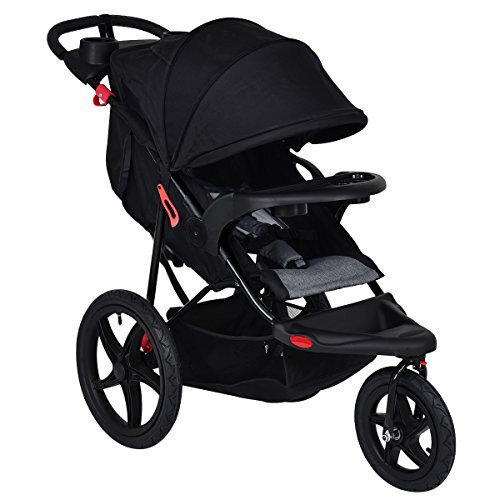 One of the best all terrain baby strollers is the Chicco Activ3 Jogger Stroller. Compatible with the Key-Fit car seat, this stroller easily transforms into a travel system for long days exploring the great outdoors with your little one. The Activ3 stroller is great for children from birth to 50 pounds. Founded in 1958, Chicco began with pharmaceutical devices and expanded to baby products after the birth of the founder’s son. For over 50 years, Chicco’s founder has been dedicated to creating better solutions for parents and babies. Chicco is committed to providing innovative products that keep your family safe, comfortable, and happy while enjoying an active lifestyle. Hand-operated front wheel locking mechanism and parking brake can be controlled from the parent console. Adjustable suspension provides a smooth ride for baby on any type of terrain – from smooth to rugged. Full coverage, extendable canopy includes a tinted peek-a-boo window, so baby is protected from the elements but always in view. One-handed folding capability makes it easy to fold and store. Storage includes a large storage basket and parent tray with 2 cup holders. Does not include a snack tray for toddlers. 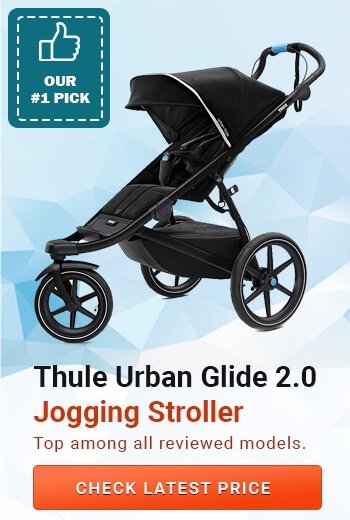 The Thule Urban Glide 2.0 Jogging Stroller is a lightweight and compact all-terrain stroller that allows you to transport baby comfortable in the city or in the countryside. The padded seat with a 5-point restraint system keeps your baby safe and comfortable for short walk/jog or all-day exploration trips. Easily take along all the supplies you need with the large cargo basket, rear mesh pocket, and mesh compartments on the seat for baby’s toys or snacks. One-handed adjustable reclining seat provides a comfortable ride for baby whether sleeping or taking in the sights. Suspension creates a smooth ride on smooth or rough surfaces. Handlebar is ergonomic, padded, and can be adjusted to multiple heights. The multi-position canopy has side ventilation, so baby is comfortable and protected from the elements – magnetic peek-a-boo window allows you to check on your sleeping baby without waking him/her. Reflective wheels and edge on canopy makes you more visible while walking or jogging. The one-handed compact fold makes it easier to transport and store the stroller. Hand brake for convenient speed control. Seat is difficult to adjust while child is sitting in the seat. 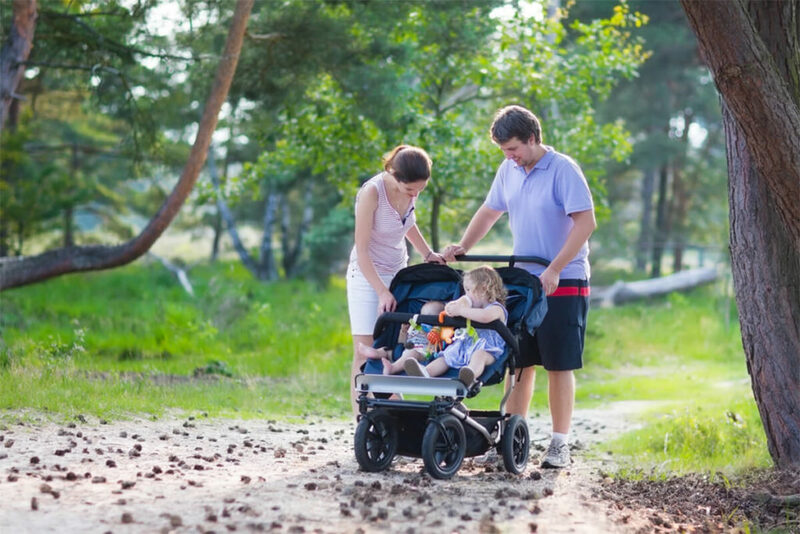 Before you can decide which all-terrain stroller is best for your family, you will need to determine how you intend to use it. Do you plan to travel and explore exotic lands? Do you plan to use it mostly for the beach? Or, do you simply want a stroller that travels easily over grass, gravel, or sandy surfaces? As with any baby product you purchase, safety should be the main concern. For smaller babies, the restraint system should be a 5-point harness. As your child gets older, you can use a 3-point harness. Some strollers can convert from a 5-point to a 3-point as your baby grows. Brakes are another safety feature that is important on strollers. Your stroller should have a system that allows you to apply the brakes easily with the tap of your foot when you have stopped for a moment. This will ensure that baby’s movements cannot cause the stroller to roll away from you. Baby’s comfort is another important feature – especially if you plan to make long sight-seeing trips or hiking trips. The first consideration is type of seat. For long trips, you will need a seat that reclines for naps. You might want to consider the padding on the seat. Also, for infants, you will want an all-terrain stroller that you can connect a car seat to. Other features that help improve comfort are canopies that provide shade and shelter from the elements. For mom or dad’s comfort, adjustable handles are a must-have – especially for long walks through an amusement park. As well as comfort and safety, you should consider the functionality of the stroller. Is it compact enough for travel? Is it easy to close – one-handed folding is best when trying to hold baby and close the stroller. Storage space is a must – especially for long days outdoors. Storage space should be large enough to hold all of baby’s needs as well as mom or dad’s needs. Some strollers have an eating tray for baby, usually with at least one cup holder. Many also have a tray for mom and dad between the handlebars for cups, keys, cell phones, and other parental necessities. Adventurous parents have learned that the adventure does not have to stop when a baby comes along. Rather than giving up the fun they have exploring the world, parents simply adapt and take baby along for the ride. Baby products companies continue to create innovative products that allow adventurous parents to remain on-the-go. 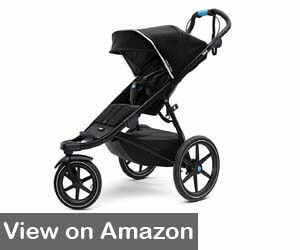 After considering the above all-terrain strollers, I have selected The Joovy Zoom 360 Ultralight Jogging Stroller as the best all terrain stroller available. The wide, padded, adjustable seat allows your child to travel in comfort from birth to 75 pounds. Not only can baby ride in comfort, but parent can bring along all the supplies needed for a day of adventure. The large storage basket coupled with the parent organizer, back zippered pocket, and extra mesh pockets in baby’s compartment keeps everything needed is within easy reach. Since outdoor adventures often come with sudden weather changes, the large canopy offers lots of protection for baby from the sun, wind, and rain. 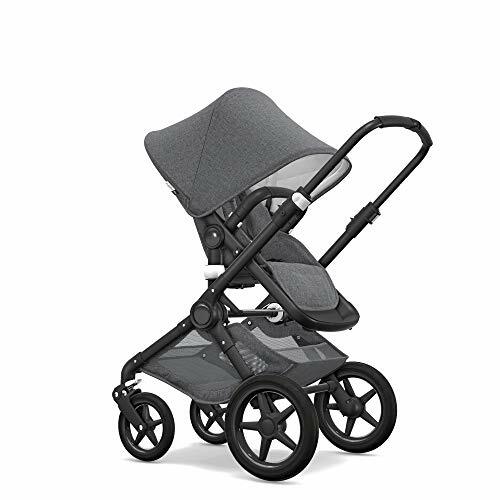 Chicco considered all the most important aspects of strolling with baby – safety, comfort, and parent’s needs – when designing this all-terrain baby stroller. Never leave baby unattended while in stroller. Be sure toys are securely fastened if you use hanging toys. Be sure hanging toys do not hang low enough to get caught around baby’s neck. Always use the safety restraint system at all times while baby is in the stroller. Always apply brakes when you stop to prevent baby’s movements from moving the stroller away from you. Never hang bags from the handlebar – this could cause stroller to tip over. Never leave stroller sitting in the hot sun to avoid plastic and metal from becoming too hot. Check to ensure pieces are not too hot before placing baby in. Follow all age and weight limits recommended by the manufacturer.